I often bake up this moist Pineapple Cake. This is one of my favourite cakes. Together with the icing looks both gorgeous and rich in taste. I baked this cake on the occasion of my Birthday. 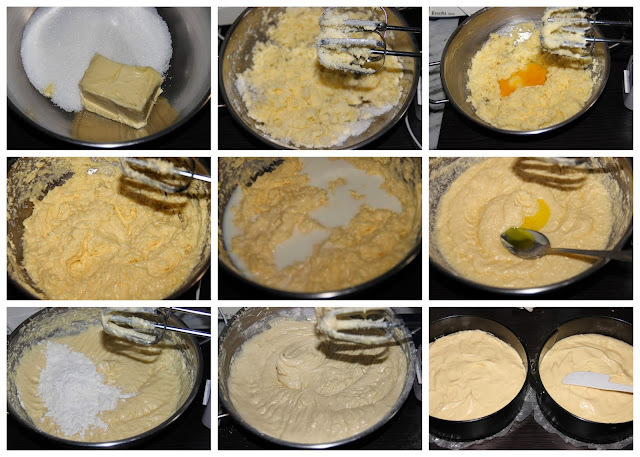 Take three 18 or 20 cm cake pans and line with baking parchment paper/ wax paper/ butter paper or grease with butter. Then dust with flour to cover all over the pan by shaking the pan and tap out the excess flour by inverting and tapping the pan. 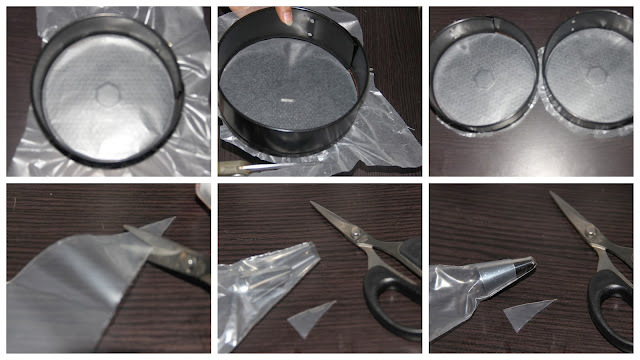 If you use spring form pan follow the procedure by keep the paper on the base and fix the tin and cutting the excess paper (or) if you use normal cake tins without loose bottom take a square piece of wax/ butter paper and fold it in the middle and again fold once again to get four equal sides and cut the edges as a curved to get a round sheet if it does not fit cut little more deep (or) Mark the edges of the of the pan using a pencil and cut the paper (or) Using a compass take the radius of the cake tin and draw on the paper and cut using a knife. Keep a drop of oil and spread it and keep the paper on top of it and make it stick on it. Beat the butter well then add the sugar and salt. Mix well using an electric mixer until creamily mixed together. Add eggs one by one and whisk well between each addition. Whisk well till frothy. Then add the milk, food colour, pineapple essence and beat well. Add the cake flour half cup at a time and fold well till combined. Scrap the mixture into the prepped up cake tins and smoothen the surface with a spatula. Bake until a skewer inserted comes out clean. Cool the cake in wire rack and cut the cake if your cakes top is not level, to get a leveled top. Ensure that the whisks and the container used for whisking are chilled prior to whipping the cream. 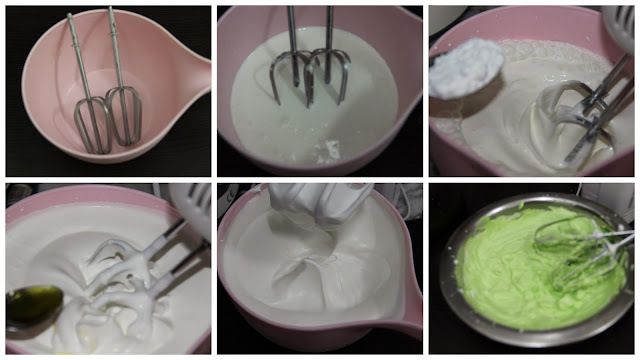 Whip the whipping cream well using electric mixer. Add pineapple essence and whisk well. Add icing sugar and whip again in between adding of each teaspoons of icing sugar. Divide the whole icing prepared into two lots. Further divide one of the lots into two. 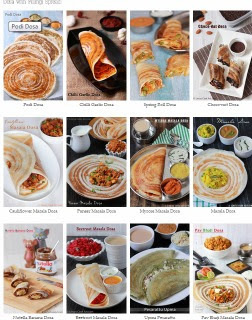 In that add yellow food colour to one lot and green food colour to the other. Keep inside fridge till you use. Cut both the cake into to horizontally into two equal halves so that you will get 4 layers( from that i have used 3 layer cake you can make 4 layer cake also). Using a pastry brush remove the crumbs sticking to the cake. Apply 2 -3 tablespoon full icing and spread evenly over the cake leaving 1cm border. Keep the second cake slightly press with hand to stick the cakes together. Apply icing on ton top of second cake and keep third cake on top of that. Apply icing ontop of third cake and keep fourth cake. I have used here leaf nozzle (green), petal nozzle (yellow) and star nozzle (green, yellow) to decorate this cake. 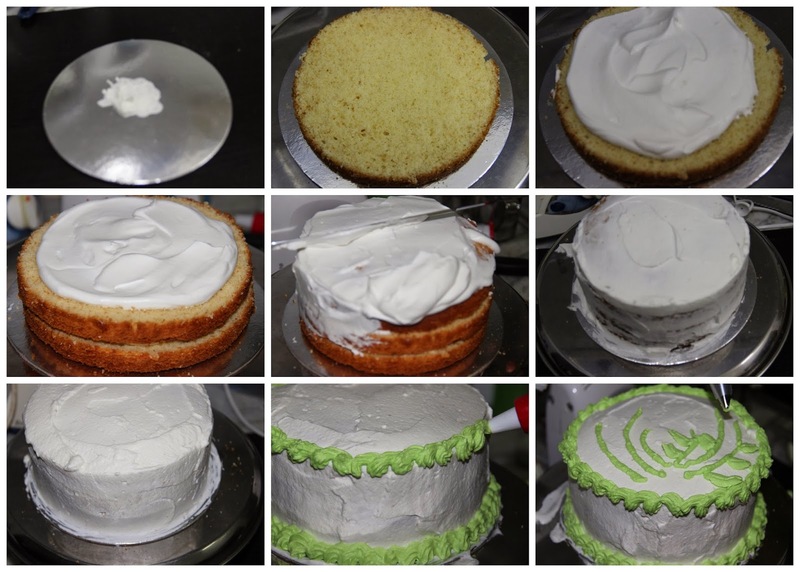 Wow beautiful Cake and nice Pictorial Instructions for decoration..
Good job lincy. Beautiful cake and well explained. Stunning one......! I need to bake one pineapple cake...... n urs have inspired me and simple and elegant decorations........! Mam can i reduce the number of eggs to one to reduce the taste of egg in cake..